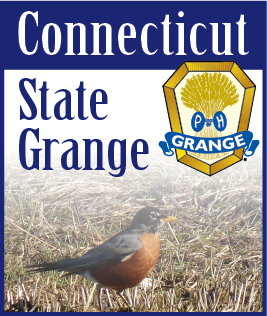 The Legislative Committee met early last December to review and incorporate any new resolutions affecting legislative affairs into the Connecticut State Grange Legislative Policy Handbook. We were able to complete this process and had the policy book printed in time for the start of the Legislative session in early January 2015. Copies of this booklet were distributed to Governor Malloy, Lt. Governor Wyman and all members of the Connecticut General Assembly. Gordon Gibson is our voice at the Capitol. He follows the bills and committees and communicates our support or concerns on the various bills presented during the session. This last year was a budget year and the Governor proposed a budget which raided many special funds. Many organizations worked hard to prevent the money from these funds from being moved to the general fund to cover his budget expenditures. We carefully watched the Community Investment Fund which funds farmland preservation and other projects. The Governor had proposed that all existing funds in the Community Investmet Fund as well as future funds be moved to the General Fund. The Grange did testify opposing the transfer of funds from the Community Investment Fund to the General Fund. Not all of the funds were saved but the entire amount was not wiped out. One important bill that was passed and signed by the Government allows the Department of Agriculture to reimburse farmers who are leasing State and town land for up to 90% of the cost of implementing a farm restoration program. The Grange testified in support of this bill. As a result of a resolution from last year’s session, one bill that Gordon testified on was SB 518 – An Act Concerning Driving with a Pet on the Driver’s Lap. Gordon’s testimony was picked up by the news organizations there. We understand WTIC radio as well as the Hartford Courant ran articles about our support for this bill. This article was also picked up by national news organizations and we understand it was in the Boston Globe along with a few other out of area newspapers. We testified in support of Raised Bill 6731- An Act Concerning the Treatment of Certain Farm Land for Purpose of the Estate Tax. That bill would exempt farmlands in estates classified as farmland under the 490 program from being included in the estate for taxes. In May, I along with Bruce Graham and Gordon Gibson attended the Legislative Fly-In in Washington, D.C. We were briefed by the National Grange on some issues then spent time on Capitol Hill visiting with our Connecticut Senators and Congressmen. The National Grange Legislative Director, Burton Eller, has been regularly sending out legislation bulletins to the state directors as to what is happening in Washington. Bruce and I attended the Northeast Regional Leaders’ Conference that was held in New Hampshire in January. Gordon Gibson attended the Working Lands Alliance annual meeting as well as their regular meetings during the year. The Grange is a partner of this organization. Both Gordon and I attended the Connecticut Agriculture Day that was held at the Capitol in March. We spoke with many different legislators that day. We were pleased that Governor Malloy and Commissioner Revitczky stopped by the Connecticut State Grange booth for a photo. I would like to thank our State President, Noel Miller, for giving me the opportunity to serve as your Legislative Director this year. I also wish to extend thanks to my committee, Charles Dimmick, Russell Gray, George Ward, and our liaison Gordon Gibson for their work and support.